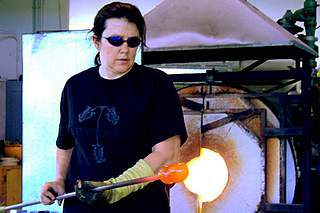 Working from their studio on Whidbey Island, WA, the highly skilled LaChausseé glass blowing team have enjoyed over two decades of success and growth as artists, as a family, and as business partners. 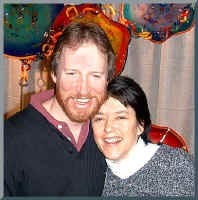 Within the first two years after being introduced at the Pratt Fine Arts Center, Dan and Joi were married, started a family, and began the LaChausseé Glass Studio. The first humble little hot shop was built under an existing carport in 1988. Three children, five acres, and twelve years later the LaChausseés were planning the construction of a new home and modern glass studio which was completed in 1999. They continually develop new ideas and are well known in the world of art glass for their skill, innovation and originality. 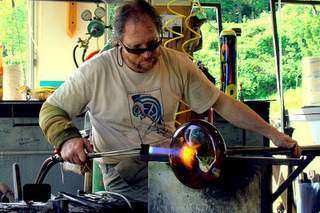 The motivation for creating art glass is inspired by immense joy and satisfaction in the work of glass blowing, their children, and each other. 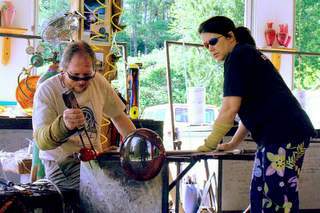 Dan and Joi have found that over time, making art together while teaching their children and assistants to work with glass has made the journey even more exciting. Each day brings new opportunities to explore potential and create beautiful designs through freedom of expression and ideas. The thrill of creating uniquely beautiful pieces has continued to grow for us since we began in the early 1980s. Every creation is unique and made by us in our original designs. The result we hope to accomplish is an art form that will make a lasting statement in any home.